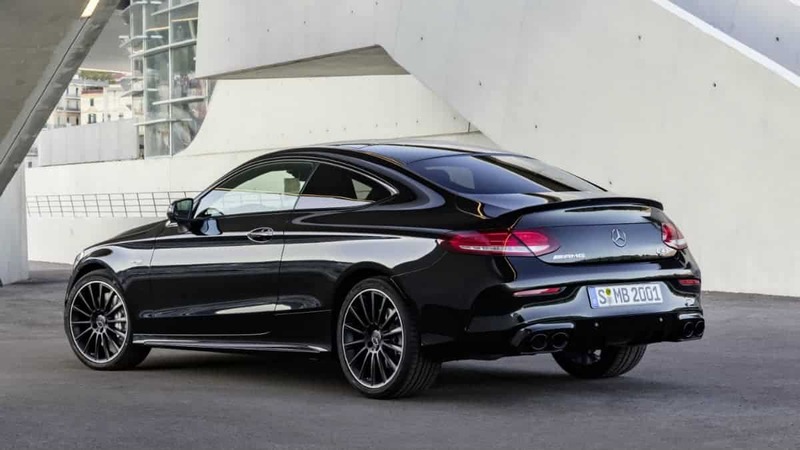 The new Mercedes AMG C 43 4MATIC Coupe and Cabriolet. Soon after Saloon and Estate, the Mercedes AMG C 43 4MATIC Coupé and Cabriolet are set to receive their own extensive update. Shared visual features are the twin-louver AMG radiator grille, muscular front apron and new rear apron with round twin tailpipe trim elements. The interior benefits from an optional fully digital cockpit with distinctive AMG displays and the new generation of steering wheels. The 3.0-litre V6 bi-turbo engine now delivers 287 kW (390 hp). Together with the fast-reacting AMG SPEEDSHIFT TCT 9G transmission and rear-biased AMG Performance 4MATIC all-wheel drive, it has been possible to further enhance the driving dynamics and agility. With a host of carefully coordinated measures, the developers at AMG have further improved the driving dynamics. The 3.0-litre V6 engine now delivers 287 kW (390 hp) and therefore 17 kW (23 hp) more than before. The peak torque of 520 Newton-metres is available in a broad engine speed band from 2500 to 5000 rpm. 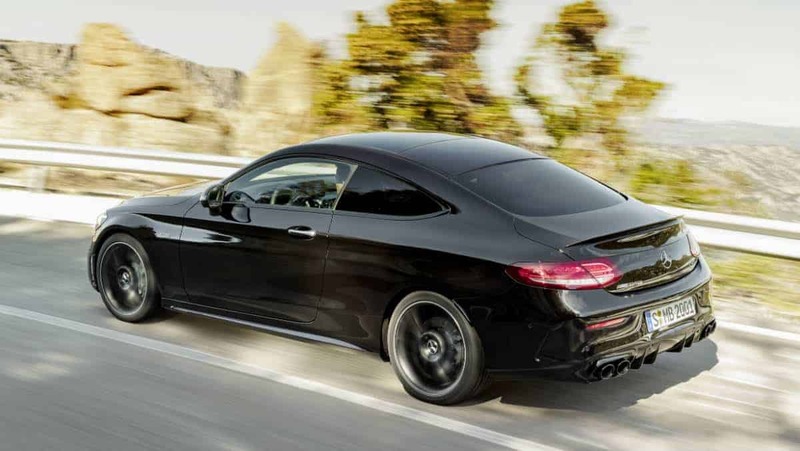 The new Mercedes AMG C 43 4MATIC Coupe accelerates from rest to 100 km/h in 4.7 seconds, while the Cabriolet does the same in 4.8 seconds. The top speed is electronically limited to 250 km/h. 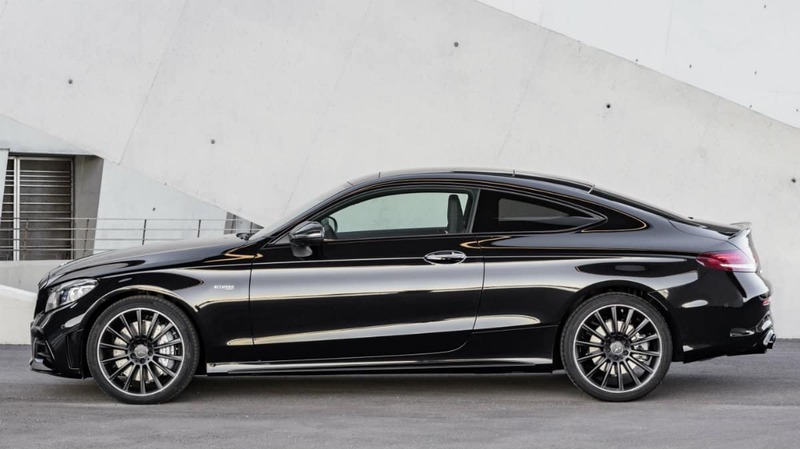 The exterior of the Mercedes AMG C 43 4MATIC Coupe and Cabriolet is considerably more expressive, even more strongly identifying the new models as members of the family. New distinguishing features include the AMG radiator grille with twin louver in matt iridium silver and the powerfully sculpted front apron with additional flics. The side air curtains in the front apron help with the optimum guidance of the front airstream. The attachment on the cross fins plus the trim element on the front splitter are finished in silver chrome. When viewed from the side, eye-catching features include the sporty side skirts plus new, aerodynamically optimized AMG light-alloy wheels. Their specifically designed outer aero rings and spoke geometry which has been optimized in the wind tunnel help to improve airflow around the wheels and thus increase aerodynamic efficiency. As part of this the developers aimed for the optimum combination of aerodynamics, weight and brake cooling, together with maximum performance and reduced fuel consumption. The rear view also conveys a sense of sporty aesthetics with two round twin tailpipe trim elements in high-gloss chrome. The rear apron with side air outlet look and the significantly more expressive diffuser improve the airflow at the rear. The spoiler lip on the boot lid is painted in the vehicle color. 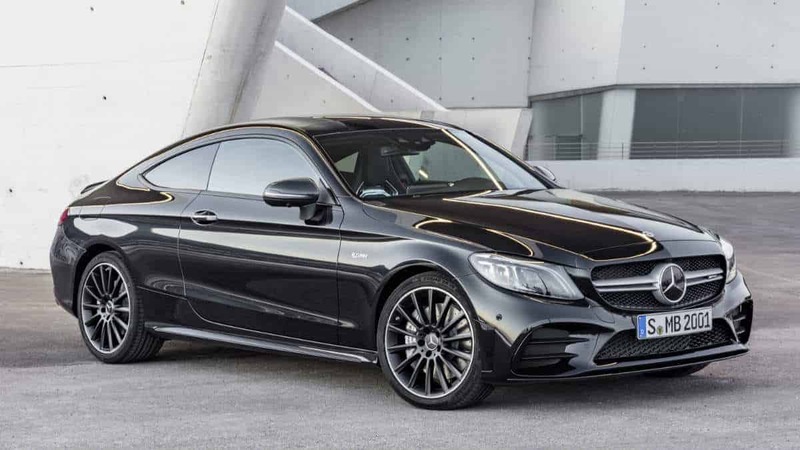 The optional AMG styling package creates highlights which are even sportier: the more expressive front splitter, standard-fit spoiler lip, broader side skirt inserts and flics in the rear bumper are finished in high-gloss black. The further equipment options include the Carbon Fibre package II, in which the exterior-mirror housings and the spoiler lip on the boot lid are finished in black sight carbon fiber. The Night package contains black elements such as the exterior-mirror housings, shoulder lines and window weatherstrips. Sporty materials such as leather, DINAMICA microfibre and aluminum in a high-quality finish continue the theme of the expressive exterior in the interior. The optional AMG Performance seats provide optimum lateral support when adopting a dynamic driving style, thanks to the special design of the seat side bolsters of the seat cushion and backrest. As an option in conjunction with leather upholstery, the seat side bolsters can be perfectly adjusted by means of built-in air cushions. The Performance seats additionally lend the interior an even more distinctive character with their racing look. They are heated and, in conjunction with leather upholstery, also climate-controlled in three stages. In the Cabriolet, they can also be optionally equipped with AIRSCARF neck-level heating. The standard upholstery in ARTICO man-made leather/DINAMICA microfibre in black with red topstitching underscores the dynamic driving character. Matching the seat design, the door center panels and dashboard are finished in ARTICO man-made leather with red topstitching. Aluminum sports pedals with black studs, trim elements in black piano lacquer with light longitudinal-grain aluminum, the black roof liner and the red seat belts create further sporty highlights. As an option, there is a comprehensive choice of individualization options. With regard to trim, the range includes trim in black open-pore ash wood/light longitudinal-grain aluminium, longitudinal-grain aluminium (doors)/black open-pore ash wood (centre console), high-gloss dark-brown lime, anthracite open-pore oak wood, open-pore walnut as well as AMG trim in light longitudinal-grain carbon fibre/aluminium and matt silver fibreglass/light longitudinal-grain aluminium. In terms of upholstery, as an option, there is leather in black, black with red topstitching, cranberry red/black, magma grey/black, saddle brown/black and porcelain/black. Whether with touchpad and Controller, Touch Control buttons on the steering wheel or via voice entry: the operating system of the Mercedes AMG C 43 4MATIC is just as versatile as it is flexible. All options are aimed at enabling the control tasks to be carried out as conveniently, quickly and appropriately to the situation as possible in this sporty environment. Just as flexible is the display of the optional, fully digital instrument cluster with 31.2 cm (12.3-inch) screen diagonal, which brings the vehicle functions directly to life with the three AMG-specific display styles of “Classic”, “Sport” or “Supersport”. Via the specific AMG menu, the driver is able to call up a host of additional information, such as Warm-up, Setup, G-Force, Race Timer or Engine Data, to make the driving experience even sportier. In addition, there is a digital indication of the current speed and selected gear. The manual transmission mode is identified by a yellow “M” and a prompt to shift up when reaching maximum engine speed, a touch inspired by the world of Formula 1. The visualizations in the central media display likewise enable further vehicle functions to be experienced even better, e.g. with animated presentation of the driving assistance, vehicle and communication systems. Extremely sporty design, a grippy shape with a heavily contoured rim and intuitive operation are the key attributes of the new AMG steering wheel in Nappa leather, which comes as standard equipment. It has a flattened bottom section and is perforated in the grip area. The galvanized steering wheel gearshift paddles support a sporty driving style with manual gear shifting. As an option, it is also available in Nappa leather / DINAMICA microfibre and also in Nappa leather with trim in black piano lacquer. The built-in Touch Control buttons are a new feature. These can be used to control the functions of the instrument cluster (left) and the multimedia system (right) by means of horizontal and vertical swiping movements of the finger. Active Distance Assist DISTRONIC and the cruise control are adjusted in the control panels on the left. The control panels on the right are used to activate the voice control and telephone, and to regulate the sound volume, music selection and other functions of the multimedia system. Well-proven and powerful: the AMG 3.0-litre V6 bi-turbo engine. The V6 bi-turbo engine boasts a high power output combined with low fuel consumption and emissions. The high power output comes courtesy of separate, larger turbochargers and 1.1 bar charge pressure, among other things. Installed close to the engine, the two turbochargers are especially spontaneous in their response. 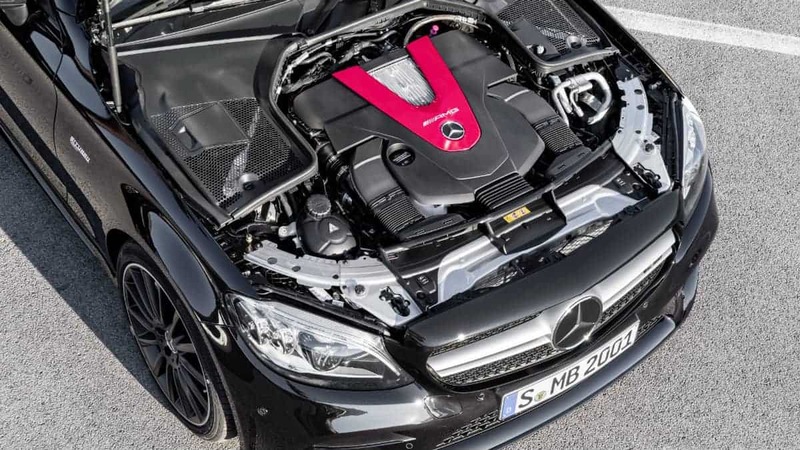 The AMG power unit can be identified by the engine cover with red aluminum insert and AMG lettering. The Mercedes AMG C 43 4MATIC makes use of the AMG SPEEDSHIFT TCT 9G transmission, which the Mercedes-AMG developers have tuned specifically for a dynamic driving experience. This has a model-specific software application to achieve very short shift times. The multiple downshift function allows more spontaneous bursts of speed, while the double-declutching function in “Sport” and “Sport+” drive programs makes for an even more emotional driving experience. Defined ignition adjustments also provide faster gear shifts in the other modes. In all modes moving off occurs in first gear in order to always guarantee a dynamic driving experience. “Manual” mode can be selected using a separate button in the center console. The gear changes are based on the selected drive program, and the driver can now change gear using the paddles on the steering wheel. Moreover, the transmission stays in the selected gear and does not automatically shift up when the engine speed reaches the limit. With the proven DYNAMIC SELECT drive programs “Comfort”, “Sport”, “Sport+” and “Individual”, the characteristics of the Mercedes AMG C 43 4MATIC can be customised at the tap of a finger. The available range extends from efficient and comfortable to very sporty. This modifies key parameters, such as the response of the engine, transmission, suspension and steering. Independently of the DYNAMIC SELECT drive programs, the driver has the option of pressing the “M” button to switch directly to manual mode, in which gearshifts are executed exclusively using the shift paddles on the steering wheel. The suspension set-ups can also be selected specifically on demand. The fifth mode “Slippery” is new, and is identified by means of the snowflake symbol. The moderate and even power delivery is specially programmed for slippery or snow-covered road conditions. The standard-specification AMG Performance 4MATIC four-wheel drive features rear-biased torque distribution with a front/rear axle split of 31 to 69 percent. This configuration provides for enhanced driving dynamics and higher lateral acceleration on the road as well as improved traction when accelerating. The single-stage transfer case of the four-wheel-drive system is flange-mounted to the transmission as a separate system. This add-on solution makes it easier to modify the torque split for each particular model, thus allowing even more individual characteristics for the respective model series. Its compact design means that it does not entail any space restrictions for passengers or luggage. With its adjustable, electronically controlled damping system, the AMG RIDE CONTROL steel suspension of the Mercedes AMG C 43 4MATIC provides both sporty driving dynamics and high comfort on long journeys. The basis for this is formed by the 4-link front axle and independent multilink rear suspension. 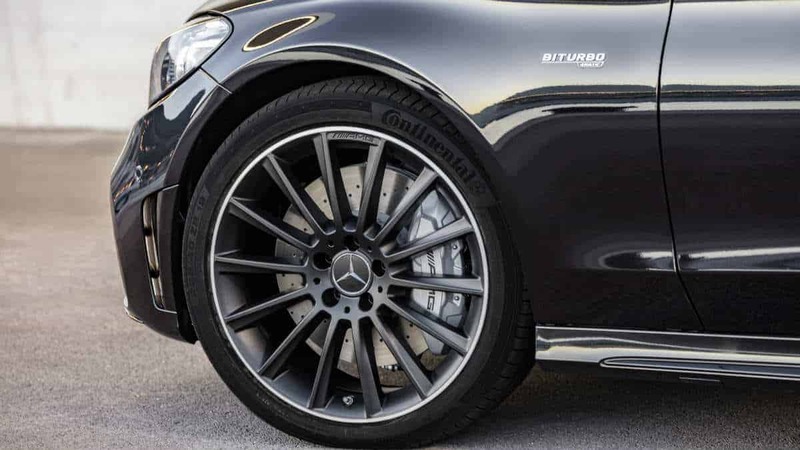 The AMG-specific kinematics and elastokinematics with newly developed components result in very high camber stability when cornering at speed. The axial brake connection on the front axle supports the agile and precise handling. The adaptive adjustable damping comes as standard. This fully automatic, electronically controlled system adjusts the damping at each wheel to the current requirements. This improves driving safety and ride comfort. The damping is adjusted individually for each wheel and depends on the driving style, the road surface and the selected suspension setting. The ideal operating point can be selected at all times on the basis of a broad scope of information relating to acceleration or vehicle speed, for example. Via a switch on the center console, the driver can select between three different sets of damper characteristics, namely “Comfort”, “Sport” and “Sport+”, and thus individually influence the driving experience — from highly comfortable to sporty. The electromechanical speed-sensitive power steering has a variable ratio. It impresses with its precise, authentic feedback. The steering servo assistance is reduced at high speeds and continuously increases at lower speeds. This means that comparatively little steering force is required at low speeds and that the best possible control over the vehicle is maintained at high speeds. The steering servo assistance depends on the selected suspension setting. In “Sport” mode, more feedback is conveyed about the driving conditions. As the virtual race engineer for recording data when driving on closed-off race tracks, AMG TRACK PACE provides a significantly extended and even more precise scope of functions. TRACK PACE can be ordered as an option for the COMAND Online infotainment system. If this function is enabled, over 80 vehicle-specific sets of data (e.g. speed, acceleration) are recorded ten times per second. On top of this there are displays of lap and sector times and also the respective difference for a reference time. Because specific display elements are shown in green or red, the driver is able to see at a glance without reading numbers whether he/she is currently faster or slower than the best time. The data make it possible to analyze and improve the driver’s skills. In addition, acceleration and deceleration values (e.g. 0-100 km/h, ¼ mile, 100-0 km/h) can be measured and saved. Thanks to a new developed algorithm which determines the vehicle position as precisely as possible, TRACK PACE even detects when the circuit is departed from or shortened. Alongside GPS data, the sensors available in the vehicle (acceleration, gyroscope, steering angle, wheel speeds) are used. The data are displayed on the multimedia display, in the instrument cluster and on the head-up display. Known racetracks, for example, the Nürburgring, are already stored. Furthermore, it is also possible to record one’s own circuits. The map display can be switched from 2D to 3D and updated online. A suitable iPhone® app can also be connected via WLAN. Customers can use it to share their experiences and data from the racetrack with other AMG drivers via Facebook, YouTube or the AMG Private Lounge. The optional ENERGIZING comfort control is also available for the new Mercedes AMG C 43 4MATIC. It networks together with the various comfort systems in the vehicle and uses specific functions of the air conditioning and seats (heating, ventilation) plus lighting and music moods. Depending on the mood or requirement of the driver, it generates a special wellness set-up to enhance well-being and performance.